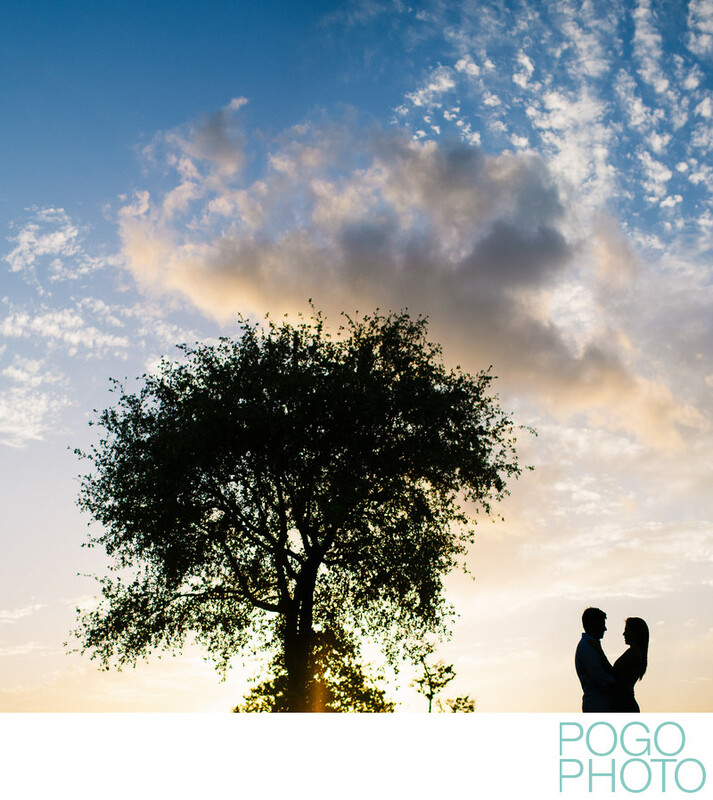 Capturing the feeling of the location and the weather can be an important element for a well-rounded engagement session, and silhouettes can be a beautiful way to accomplish this. Incorporating a square cropping, this image works on several levels, including color and shape. The couple's bodies are held tight at the waist, while leaning away from each other just enough to see their faces clearly, which creates a pleasing heart shape to their joined bodies. On a more conceptual level, showing the silhouette of the bride and groom dwarfed by the silhouette of the tree tells a broader story about the vastness of nature and the world, while drawing attention to the small but tight bond formed by two single people becoming one married pair. The speckled clouds just before sunset illuminate the deepening blue sky as evening approaches, and the ethereal shapes dotted in the sky echo the dotted tree leaves surrounding the branches of the solo tree. We pay attention to the surrounding environment during portrait sessions because the feelings evoked by seeing the way the sky looked on a day that you felt so in love can be very strong; even reminding you of feelings of love when you look back on the image months, years, or decades later. This image was taken at the golf course at PGA National, a private country club in Palm Beach Gardens, Florida. This couple chose PGA National as the location for their portraits as it has personal meaning to them; they are members and spend much of their spare time golfing and enjoying the beautiful Floridian weather year round. We always recommend choosing a place for your engagement session that has personal meaning or sentimental value in some way; we are able to capture the feeling of any venue, and having it feel special to you is one of the most important aspects of choosing a locale. Location: PGA National, Palm Beach Gardens, Florida.